A journey of 9,500 miles. Why recyclables are heading overseas to Asia. A GreenWaste of Palo Alto residential solid-waste driver makes his rounds in south Palo Alto. Photo by Veronica Weber. Ricardo Hernandez, a solid-waste driver for GreenWaste of Palo Alto, tosses a bag into his truck. Photo by Veronica Weber. • View this story alongside photos slideshows, videos, interactive charts and more on our Atavist page. Ricardo Hernandez was finishing up his collection rounds as a solid-waste driver for GreenWaste of Palo Alto recently when he spotted a black trash bin overflowing with garbage bags. "Most of the stuff in these bags is recyclables and food waste," said Hernandez, shaking his head and tossing the excess trash bags into the truck. One only needs to take a tour of the Sunnyvale Materials Recovery and Transfer (SMaRT) Station, where Palo Alto's trash is delivered for sorting before being sent to the landfill, to understand Hernandez's concern. There are plastic water bottles, cardboard boxes, yogurt containers, soda cans, orange peels, apple cores and other recyclables and compostables mixed in the mound of garbage on the floor. On average, 70% of what Palo Altans toss into their black garbage bins is recyclable and compostable, according to the city's latest Waste Characterization Study. At the SMaRT Station, these salvageable materials are separated from the garbage. It's an extra step in the city's recycling process that has helped divert tons of waste from landfills. Out of the 27,000 tons of waste processed at the SMaRT station from Palo Alto last year, over 8,500 tons (approximately 30%) were diverted. This extra sorting step is just one of the many tactics Palo Alto is employing in its ambitious Zero Waste Plan to divert 90% of its waste by 2021. It's a goal that's well ahead of the state's target of 75%. The plan includes incentives that encourage residents and businesses to reduce their weekly garbage loads; proposals to ban certain types of single-use plastics and foodware items; and an ordinance that would regulate construction and demolition debris, which currently makes up 44% of Palo Alto's total landfill disposal. "I think we realized a long time ago, that landfill space is a limited resource," said Daniel North, district manager of Morgan Hill's Kirby Canyon Recycling and Disposal Facility. "It's in everyone's interest to make sure that as little material goes to the landfill as possible." But as Palo Alto works to achieve zero waste, there are new environmental obstacles arising from changes in global recycling standards that the city must consider since it currently sends about 75% of its recyclables overseas. "We're struggling here with looking ahead at the ultimate solution and yet trying to do something in the immediate future," said Phil Bobel, Palo Alto's assistant director of public works. Every day, after 750 tons of garbage from Palo Alto, Mountain View and Sunnyvale is processed and sorted at the SMaRT station, the remaining refuse is compacted and loaded onto a fleet of 30-40 trucks, which head to the Kirby Canyon Recycling and Disposal Facility in Morgan Hill, which is operated by the company Waste Management. Hidden behind rolling hills of serpentine grasses overlooking U.S. Highway 101, bulldozers at the landfill site push the debris onto a flattened mound dubbed "the pancake," pounding and grinding everything from discarded mattresses, filing cabinets, laminate floor boards, VHS tapes, estate-planning paperwork, and lots and lots of plastic bags. For odor control, the mound is then covered with alternative daily cover — often a blend of soil, sludge, recovered plastics and ground-up construction debris. Underground are a series of methane wells connected to a large pipe and blowers that vacuum up the gas, which is then channeled upward and burned off by a flare, resulting in carbon dioxide and water and inspected annually for air contaminants. Though the technology can be seen as a feat in managing waste and maintaining clean emissions, North sees the process as a wasted opportunity. He said the company's Altamont landfill, in comparison, has an onsite power plant that converts methane gas into renewable energy and is an example of what could be done at Kirby Canyon. As cities further reduce waste with increased recycling and composting habits, North said landfills will have to convert from mere dumping grounds into sustainable energy sources. "The world is changing," he said. "We'd like to see less material go in the landfill and more of it be diverted, and that's why these facilities are adapting over time to be able to handle that." Just outside the Port of Oakland, up to 100 trucks carrying cargo containers pull up next to the Ever Reach Logistics processing center, where a team of eight inspectors clad in yellow vests and hard hats from the China Certification and Inspection Group await to inspect shipments headed overseas to China. Inside each of these containers are about 30 bales of corrugated cardboard — think Amazon and moving boxes retrieved from recycling facilities. Directed by the Chinese government, the inspectors use a strict cardboard-screening process. They snap photos, remove the bales and scrutinize each one up close, sometimes even using X-rays to make sure each bale contains less than 0.5% contamination from outside materials, defined as anything from mixed paper to plastic bags to too much moisture. Bales that don't meet the 99.5% clean metric are rejected and sent back to recycle buyers. "Now that they've dropped to a half percent, it's darn near impossible to meet, but we're doing everything that we can to meet it," said Emily Hanson, director of business development and communications for GreenWaste Recovery, Palo Alto's recycling sorter. The strict new standards, which began in March 2018, are part of China's National Sword policy that has halted international imports of cardboard, mixed paper and plastics while the country adopts more environmental protections to end its role as the world's dumping ground. "It's thrown the entire global recycling market into chaos, and we're talking the whole developed world," said Mark Bowers, Sunnyvale Solid Waste Programs division manager, who oversees the Sunnyvale SMaRT station. In 2017, the United States exported 12.8 billion pounds of fiber and plastic products to China. In 2018, that number dropped to 8.1 billion. It is expected to keep dropping as China outlines more restrictions. This has left domestic recycling operations scrambling to adapt and find new markets for the materials. Contamination is the problem everyone is trying to solve. It's a dirty word in the recycling industry. In Palo Alto, bales of cardboard and mixed paper, which make up roughly 70% of the city's exported recyclables, can become tainted instantly by poor sorting in the city's single-stream program, which mixes all materials together. Liquids in soda bottles, half-filled jars of peanut butter, oily residue from takeout containers can ruin potential fiber shipments. In an effort to combat "dirty sorting," Palo Alto recently launched its Recycle-Ready campaign, imploring residents and businesses to remove food waste and liquids before tossing cans and bottles into bins. At the GreenWaste Material Recovery Facility in San Jose, which sorts 18,000-19,000 tons of Palo Alto's recyclable goods every year, six new optical sorters are being installed to better handle the enormous volume of mixed-paper products and make them marketable for the changing international buyer demand. In 2018, GreenWaste stopped sending recycled paper products to China altogether. Because there are few paper pulping mills operating in the United States, GreenWaste now sends paper to Korea, Vietnam, India, Thailand, Indonesia, Malaysia and Taiwan. Even with the China restrictions, waste paper is still the Port of Oakland's largest export, making up 18% of all exports last year. That equates to 110,400, 20-foot containers shipped every year. One reason why so much recycling is shipped overseas is because many containers arrive in the United States carrying imports and would otherwise be empty on the return trip home. "As a recycling industry, we've just taken advantage of the fact that the shipping containers need to go back," Hanson said. "That doesn't mean that we know exactly what happens once it leaves our shores." This is a reality many recycling sorting facilities are coming to terms with now that the markets have shifted to mainly Southeast Asian countries with questionable environmental practices. "We're essentially relinquishing control of those materials to those (countries) that don't have the environmental policies that we do and don't have the same tracking that we do in some cases," Daniel North of Kirby Canyon said. No one understands this better than Palo Alto resident Bob Wenzlau, who helped launch Palo Alto's curbside recycling program in the 1970s. Most recently, he spoke with city leaders and representatives from GreenWaste who then crafted the city's new Environmental and Social Impacts of Processing Recyclable Materials guidelines. "It's really urgent that we start waking up to this new reality," Wenzlau said. "I can almost say that there is no single destination in Southeast Asia that would satisfy either our basic environmental or basic social standards, period." The guidelines direct the hauling company to establish a tracking system that informs residents where plastic and paper ultimately end up. GreenWaste Recovery has appointed its director of sustainability to take the lead and intends to begin preliminary reporting later this year, working in tandem with the waste hauler and the San Jose recovery facility. "Sustainability is in Palo Alto's blood, and this where we can make our mark," Wenzlau said. There's a reason for concern: 77% of the world's mismanaged plastic waste (plastic that is at high risk of making its way into watersheds and oceans due to poor disposal practices) comes from the same countries to which United States sent 1.3 billion tons of plastic last year, according to the article "Plastic Pollution," published in Our World In Data. Unlike plastic bottles and milk jugs, which are mostly processed within the United States, plastic wrap, take-out containers, plastic drink cups, coffee lids and all plastics marked No. 3-7, don't have any domestic markets and are the biggest source of plastic exports. "I view the numbered triangles (used to identify recyclable plastics) as a gigantic marketing gimmick put out by the virgin plastics producers to give consumers the impression that all plastics are recyclable," Bowers said. "They're not." As part of Palo Alto's zero-waste goals to help curb the volume of plastic use, Bobel noted that city staff will be bringing forward the first of three proposed ordinances to ban certain kinds of single-use plastics before the City Council on May 20. If approved, the first phase of the Foodware Packaging Reduction Plan would ban plastic straws, utensils, drink stirrers and plugs and require alternative compostable or reusable objects in their place. "The ultimate solution is waste reduction, especially for those single-use items," said Eric Cissna, environmental outreach coordinator for GreenWaste of Palo Alto. "We just need to stop generating them in the first place"
Michael Gross, director of sustainability at Zanker Recycling, beams with pride as he guides a tour of the 168-acre recycling and composting operation in San Jose. On the site of a former landfill, massive machinery grinds lumber, crushes concrete, plucks asphalt shingles and sorts scrap metal from demolition debris. In the middle of the site, 16 anaerobic digesters of the ZeroWaste Energy Development Company convert Palo Alto's and San Jose's yard and food waste into renewable biogas energy and compost. Next door, a 240-foot conveyor belt churns and sorts 16 types of construction and demolition debris (C&D) materials at 60 tons an hour. "I'm just like the best-looking garbage man you've ever seen," Gross laughs as he talks about the scale of his operation. "I'm the only one out here doing this. That C&D curbside line ... nobody in the industry has something that big." Last year the C&D operation processed 185,000 tons of material and diverted 80% of it from the landfill. Palo Alto has taken notice. Roughly 44% of all landfill waste from the city is composed of construction and demolition debris from the numerous development projects across town. The city staff intends to bring an ordinance requiring the deconstruction and separation of materials at the source before City Council on May 20. The proposal would make mandatory the sorting of salvage from residential and commercial demolition projects, which would then be sent to the Zanker facility. "We think those deconstruction-related initiatives are some of the largest short-term initiatives in terms of being able to impact diversion and impact waste," said Ron Arp, zero waste manager for Palo Alto. "It's not only waste diversion, keeping it out of landfills, it's a better use." "The big thing about garbage recycling is getting rid of the stuff right and making sure everything you take in you get rid of," he said. "You've got to find a home for it." • Weekly journalists discuss this issue on an episode of "Behind the Headlines," now available on our YouTube channel and podcast page. About the video: Take a look inside the Sunnyvale SMaRT station which processes 750 tons of municipal solid waste per day from the cities of Palo Alto, Mountain View and Sunnyvale and recovers 31% of compost and recyclables from the landfill. We need to develop recyclables into alternative energy sources...not so much plastics as this may pose an environmental hazard but organic waste material. I've always been impressed with how Dr. Brown was successful in converting his nuclear-powered DeLorean to bio-fuel (aka produce material wastes). If this can be accomplished with a complex Flux-Capacitor design, we most certainly have the technology to apply this process to conventional-powered mobiles. When Asia says no more to exported recyclables, then we must consider an alternative. Until then, keep those barges headed out their way. It provides jobs for the grateful locals. For some folks, waste needs to be disposed, for others, waste is resource in a wrong place. There are businesses established based on recycling the waste material, such as the recycled plastics are used to make printers' housing, recycled metals are used in mother boards. Return of Investment is the only thing it matters. Recycle it into a slipper. I think this is pretty funny. In the old days, Palo Alto had clean recyclable streams. Separate boxes for paper, cardboard, glass and metal, etc. High value, no contamination. Then greenwaste convinced the city to go to the large mixed bins so that greenwaste could save money collecting the waste. And the city paid for the initial cost of the bins. All so that greenwaste could reduce THEIR costs. Now we find out that no one wants the contaminated waste and it is expensive and hard to separate out. Why don't we clawback the bonuses we gave to the city employees and city manager for their wonderful service and short cited thinking that got us into this situation. Not only did we used to have well-sorted recyclables, we also used to put clean items in recycling until we were told by our waste management that we SHOULDN'T clean things before putting them in recycling because of water. I read this to incredulous members of the household and we started putting items in without rinsing. I do not mind going back to sorting and rinsing. Just tell us what to do. And sheesh, stop talking about the problem as if it just happened. Someone goofed, it can be fixed. merry is a registered user. Another fraud that became an industry! Remember when we were issued burlap sacks for our cans? Now it’s complicated expensive and does not work. Seriously - there are vitamins in banana peels. Try washing a banana before eating it, and then putting the washed peel into boiling water, allowing it to seep and become a flavorful tea. I tried it and it's great. Must be done after eating the banana though. Don't think it would work as well, when peel turns brown. eileen is a registered user. @I like Bananas, stop being ridiculous and pay attention to the issue. Other than eating bananas, do you have a real solution this is problem? > Try washing a banana before eating it, and then putting the washed peel into boiling water, allowing it to seep and become a flavorful tea. Those who remember the late 1960s will also recall the concept of scraping the inner lining of the banana peel & smoking it in lieu of marijuana. Donovan even wrote a song about it...'Mellow Yellow'. Countless people tried this & found that marijuana had a much more profound and noticeable effect. In any event, whether tea or smoke is made from the discarded banana peel, you still have some residual garbage. Probably best to just toss it in the garden & let the residual decompose organically into the ground. Fossil fueled consumerism is a registered user. We use fossil fuels to ship cheap manufactured goods over thousands of miles of ocean to "save" money. We ship tons of packaging and dirty waste back to those same countries to manage our waste. 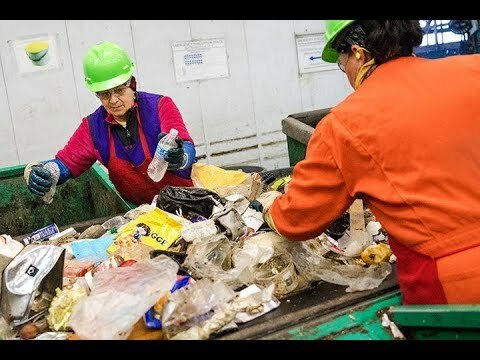 It would be great if US companies paid US citizens a decent wage to make stuff closer to home, pay a little more for labor, and manage our waste here. We would then have control to truly manage environmental impacts (assuming we really want to--I do. ), create jobs, reduce fossil fuel emissions from long-distance shipping to minimize enormous long-term unmeasured costs of climate change. Cheap stuff from overseas is not cheaper if you consider the long-term cost of the environmental damage of this kind of foolishness. It's time for us to clean up our own messes and own the true cost of our consumerism. Short-term profit motive is the enemy. Greed truly is a vice. Our children and grandchildren will thank us for considering their future as we make our consumer and waste management choices. Reduce what we buy. Reuse what we can. Recycle as much as we can. Most importantly, reduce our fossil fuel footprint. That is the single most important thing we can all do for our kids. My beloved grandmother who died forty years ago would be appalled to see how we wastefully are living today. We can do better. We HAVE done better. Chris G Zaharias is a registered user. It seems to me that the most environmentally friendly things for PA to do would be to reopen the landfill. As I understand it, the knock against landfills is that *poorly-managed ones* are conduits to plastics and pollution entering the environment, the ocean primarily. If PA's landfill continues to be well-managed, that risk is largely mitigated whereas it's not if our trash ends up in SE Asia. > Other than eating bananas, do you have a real solution this is problem? Bananas, apples and oranges are the most popular fruits in America & I have the utmost appreciation for them. Their skins are bio-degradable, the fruits provide healthful nutrition & are easy to carry in a brown bag lunch. They are also popular (along with cherries) as slot machine symbols. Back to topic...isn't ironic how we import tons of plastic products from Asia only to send much of them back as recyclable materials? The oceanic shipping lanes are inundated by this back & forth transport of plastics. One possible solution would be to convert the plastic into viable construction & building materials to meet the expanded housing & office demands of the SF Bay Area & elsewhere. This would in turn reduce global steel production & the pollution that emanates from its manufacturing process. Plastic could also be used for building bridges & modern sports arenas. It's flexible, strong and the pigments could be added to into the epoxying process so exterior painting would now become a thing of the past! We have the technology and the engineering know-how. City needs to develop volunteer network, to hunt down any business who uses disposable plastic in their business that cannot be recycled in the US, setup initiatives to ban them or tax them to make it economically not viable. Eventually the countries who use or produce these plastics needs to pay recycling cost.